1. The release of Loki’s Minions CTF that started capture the flag! 2. Threewave CTF release and we switched the server at work from Hexen to Q2 CTF. 4. The old school CTF pub games at Stoogeville, Netdoor, etc. 5. Playing with the gang at Sentry’s no tech server…good times and some of those guys play at ACME now too! Love ya! Mean it! 7. The evolution of MatchMod to TMG Railwarz. I stopped all other mod play and went rail only. Made friends with a bunch of great players; in ACME and other clans also…good people too numerous to mention. 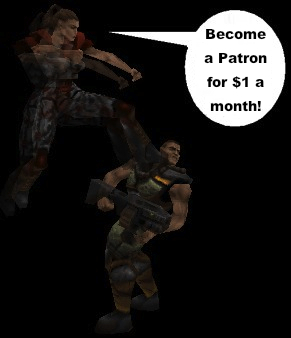 One short story that probably only old-school rwz players can relate to…was a game on ACME’s Daffy server at the time and one player was making such amazing rails, unbelievable shots, so I went spec on him. Was almost sure this had to be a bot so I recorded demo…come to find out, it was Akuma using alias….that fkr. He never let me live it down. :wink: To this day, there is no one that can match him with railgun. Playing on the Zone (MSN Gaming Zone) and becoming a dominating presence there. grunt’s post from a while back seems to fit this thread quite well.. I miss being able to play til 6am and having a full server. Good times. Playing 12 hours a day was always pretty exciting. I remember knocking PSC-Shoot off the CLQ to take #1 some years ago. I had also worked my way into the top 10 addicts with hours played, and some other stats. I miss GOOD pickup games. the ones we set up these days just don’t have it the way they used to. Some of you may remember me. I used to play from around 98-2002 or so. I was curious how q2ctf was doing it so I googled it and ended up here. I got this really nostalgic feeling so I decided to post my memories of q2. 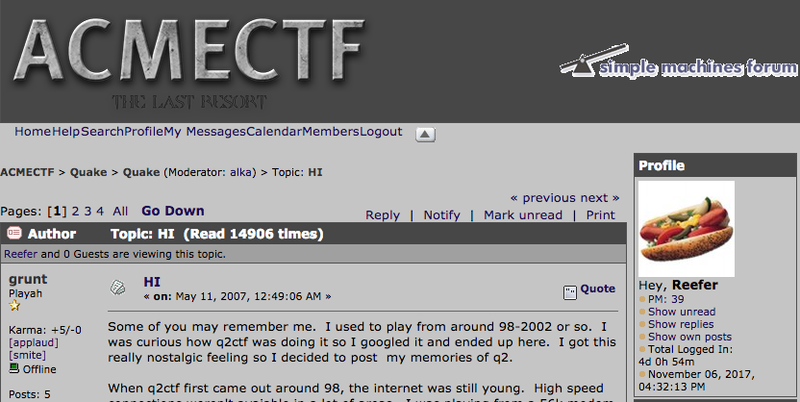 When q2ctf first came out around 98, the internet was still young. High speed connections weren’t avaiable in a lot of areas. I was playing from a 56k modem with 300 ping at best and 400 ping for west coast servers. The best server at the time was YYZ, which I believe was run by L-fire. The two most famous players at the time were Thresh and Immortal. I remember spectating Immortal on YYZ and he would join a game with 30 players and just dominate. This was the first time I saw such accuracy with railgun and the power of the quad, though I don’t think anyone was using a quad timer. I eventually got an ISDN connection, which gave me a steady 180 ping, so I could at least compete with the college T1 lpbs. At the time it cost like 100 bucks a month. Back then the q2ctf ladder was the OGL. Some prominent west clans were TULL which became bzkr, es – elite strike, ]R[ – reactive which became SS, KT. Prominent east clans were ]pm[ – peacemakers, pV – pure venom, ]LoR[, RD – red dragons. For some reason I didn’t like joining clans, especially the elite ones, but at the same time I got tired of pubbing. This guy Warlord got a bunch of random players, including me THC2 (my first handle), to scrim the #1 OGL clan at the time pV. pV’s known players were cessp00l and Alpacino. We scrimmed and beat them at q2ctf2, which pretty much shocked everyone. Needless to say this gave us a lot of confidence and we officially formed the clan =DA=. We proceeded to win pretty much every scrim but we still didn’t play most of the top 10 yet. We had problems with the leader so we reformed as -W- or Warbringers and kicked Warlord out. We entered the ladder ranked last at around #110. After a few months we cracked our way into the top 20. I believe it was -es- who eventually knocked pV off #1. Along came this clan ]R[ or reactive. They eventually took the #1 spot from es and was undefeated. ]R[ got interviewed on popular gaming sites and they revealed they played on a lan – something no other clan did. TULL was a zerg west coast clan. They were soo big they needed sub clans. Eventually TULLs best players PUNISHER and merton formed bzkr and climbed the ladders and dethroned ]R[. Around this time ’99? the OGL ladder data got erased and the ladders were reset. Teams were ranked according to whoever joined the new ladder first. es became the first legitimate #1 in this new ladder. On our way to the top 10 we faced our first major roadblock. Till now, bzkr had been undefeated and they challenged us. They were heavily favored to win, but we went on to beat them then take #1 away from es. We held #1 for a few months and this is when I got hit by the mmorpg bug. W, es and LoR were imo the 3 top teams at the time. We only had about 6 players on the roster so W merged with RD. I quit q2ctf for about 2 years. The best ctf players imo at the time were me, quoc, Tasoth, Bluesshred, vynn, attila, pleb, RD-Richy-III, Dragoon, and some peacemaker, SS guys. The best pub servers were yyz, Springfield, and pm’s server. I came back around ’01, disguising myself under a new alias named grunt. During my 2 year abscence q2ctf had changed quite a bit. I didn’t know what the hell a nosepak was and people were grappling on the floor to slingshot themselves. I realized cheating had become rampant. The first thing I did was check the OGL ladder. I wondered if I could retake #1 ladder spot. What was once 100+ teams was now barely 10 teams with clan smile :-) on top. I quickly learned smile was like an all star roster and was pretty much unbeatable. Some names I remember are Bub, joem, high, 101, godspeed. I guess smile was soo dominant that it killed the OGL ladder. I gave up on the idea of a ladder so I joined a “fun” clan, appropriately named clan poop. This was not a competitive team. I remember ]L[AlPacino tried pretty damn hard to recruit me away from poop, but I didn’t like how he just recruited based on skill and cut players left and right when they had a bad scrim. AlPacino previously had a well rumored death IRL, and it was pretty comical when he came back from the dead to play q2. A new league started up, this time with the idea of no all star teams. I forget the name of the league and who started it. The best players would be captains and there would be a NFL-like draft. Guys like HomelesS, joem, crow, AlPacino, 101, and a few others were captains. This league had a decent life but it eventually died. $lasher started up clan usa for clanbase. I think he was previously teamed up with Vapid in clanbase. Eventually the euros realized Vapid was cheating, so $lasher needed a legit team. There wasn’t much USA competitive play so we decided to play euros clans despite the ping disadvantage. Clan usa would be the best q2ctfers from the US east coast. We had west coast US on the roster but they would ping about 180, so they didn’t really play except crow and HomelesS. Soon, somewhere around 2001-2002, we learned the booster strat from the euros. The top euro team at the time was tm. I remember watching fettson play. He was the only player that really impressed me and was fun to spec. The euros favorite map was ctf1 – a map which was laughed at by most noobs in the US. For a long while US, pretty much took a beating on ctf1. ctf3 would be our best map, because it was ping friendly. In a scrim we did beat z (probably 2nd best euro team then) on ctf3. Our best scrimming partners were TuR and ewc. Somewhere along the line usa and TuR merged. I took my 2nd retirement in 2002, but for only a few months. When I came back, I noticed my ops in #usa.q2ctf was gone. When I asked for ops, I basically got the no response from $lasher- I think since I basically was not playing q2 any more. For some reason this kinda ticked me off. I decided to make my own clan to scrim against usa, so the first person I got was 101 and we took on his old clans name mdk. I recruited the few good players that were not in clan usa. I only remember 101, myself and sb on this team, though we had more. I don’t think Clan usa liked what I did. They didn’t want to scrim under the name usa, so they made the name R? or something? Their team had joem, $lasher, rapace, sanity and I forget who else. I think these 2 clans lasted maybe 2-3 weeks. It was fairly even teams but I think some of the usa players feared losing to us. Basically we never scrimmed because there was always excuses of missing players. Instead, we played captains games for the new few weeks. I did eventually get ops back and rejoined clan usa. I have to give props to $lasher for keeping usa.q2ctf alive for soo long those days. Did he ever upgrade his mac? still listening to viking metal? My 3rd retirement in 2002 was the last one. 101 had gotten a bunch of us to play enemy territory. We got a bunch of q2ctfers like myself, Bub, high, 101, sb, rom and used the name clan smile. We never became #1 but we were somewhere around #5. We got 3rd in some major tournament and we won gift certificates, but they never sent it to us. We became pretty popular and peaked at around 75 people in our irc channel. Where is high and stussyboi these days? I dunno about high, he had quit et and went to play online poker last I remember. Me, 101, sb, rom quit enemy territory at our peak to play lineage 2. crow played a little bit of et and lineage 2. I still talk to 101 and sb every few months. 101 went on to play wow. sb plays some age of empires and console games. I miss those guys, sb and high and 101 and I got along pretty well together. I never really spoke to you so much, but if you remember I was in your ET clan for a bit but I quit “couldn’t really get into it”. But the old day’s were great I remember all those clans and I was there playing against those clans with the old KL, Spb, XcP guys for the League/Ladder matches. I was with KL when we ran off a 45 game winning streak on OGL with guys like Jade, atilla, Rail, Tasoth, Turk, Dinner, Tomato, SB, egg, and myself. That was on either the League or Ladder “forgot which one” because we were able to be allies with other clans and KL was compiled of SpB, KL, and XcP guys. Great times, only thing is that i wish that ventrilo was out then. As of today the Q2CTF community is small but we still play from time to time. Some are playing RA2 as well these days for leagues on OGL. A few years back we play against the euros in that national cup. Our line up I believe was the following :$lasher, Sanity, you, High, crow, ksoul, hops, naveed, pleb, squeaky, Naveed, joem, degen, and myself. If we weren’t so ping fucked we should have won it all with that talent but $lasher missed a bunch of rails….rofl…..just kiddin bro. Well a bunch of us are on ventrilo at night if you wanna stop by and say hi and frag a bit the server is doom8.nrgservers.net I think the port is 3565 and password is lawl. if that not the correct port someone on irc will give it to you on #quake2ctf on ETG. But the old day’s were great I remember all those clans and I was there playing against those clans with the old KL, Spb, XcP guys for the League/Ladder matches. I was with KL when we ran off a 45 game winning streak on OGL with guys like Jade, atilla, Rail, Tasoth, Turk, Dinner, Tomato, SB, egg, and myself. That was on either the League or Ladder “forgot which one” because we were able to be allies with other clans and KL was compiled of SpB, KL, and XcP guys. I remember Kittens Litter. Basically I considered LoR and KL to be the same clan with a different name. KL/LoR was definetly one a the very few clans able to trade blows with us. I always thought LoR gave us tougher matches than es, mainly cuz es was not good with quad maps and they would always try to pick non quad maps vs us. It was in the league were each map represented a planet. A lot of wierd maps with names I forget got played. Wargrounds was a semi-popular map at the time. I remember all those guys except Rail and Turk. I remember Jade, he tryed out for us and we were considering recruiting him, but he wound up at SS, which was another good clan. I remember a good beating we got from attilla and the BFG whores of LoR, on ctf1. I considered attila one of my main nemesis at the time. Tasoth was easily a top 3 defender in my book. I remember thinking you were a gerat player grunt, you always would pick me for PU’s when noone else would (mostly because of my 300 ping). And when you left I remember saying once that you were one of the best. And everyone would say that you were “alright” but you were nowhere near as good as `joem (except for `joem who said he didn’t know and didn’t care). I also remember SB, because you used to +k+b me from IRC on a daily basis and was the only person that has actually made me mad IRL. Then about 3-4 months before he quit q2ctf we became good friends, and he even invited me to smile for ET. But by the time I went to dl it you guys had moved on. Good to see you on again bro, and come on vent some time.